"We kept working away at the car all day and [engineer] James (Small) and I tried to improve our weaknesses. We found good pace on used tyres and on our final run we went really quick. I didn't expect that early speed would translate too easily over to new rubber and we weren't quite sure what we'd end up with so it was nice to do a clean lap and feel comfortable with the car." "All in all we had a relatively successful day. I would have liked to have been quickest, but that's the way it goes - just got pipped at the last minute there by a quick FPR car. But all in all this weekend's about improving on our base and I feel like we're well on our way to doing that. I think qualifying is going to be tough – so many cars within such a small time gap. I think we should be happy out of the day, but let's not get too far ahead of ourselves, we've still got a lot of work to do. We're tracking better than last week though." "Today's result is alright but it's very hard to read who's done tyres and who hasn't at this place. The track grips up and times get better; then the new part of the track is rubbering up as well and people are getting a gain there so it's misleading. Tomorrow is the true test but it's a good start. It's good that we can roll it out, do a bit of tuning and end up third quickest. "I don't think there's extra pressure being at a home round. I'm my own biggest critic so I always put the pressure on! It's nice to have the support of the home crowd but I just want to do the best job I can and if I can do that we'll come away with a good result." "The car's actually working really well. "It was a little bit frustrating in the middle section just using one set of tyres. As the tyre was degrading, it was hard to get a read on the car and I got probably a little bit lost and frustrated just because I didn't know where the car was at. 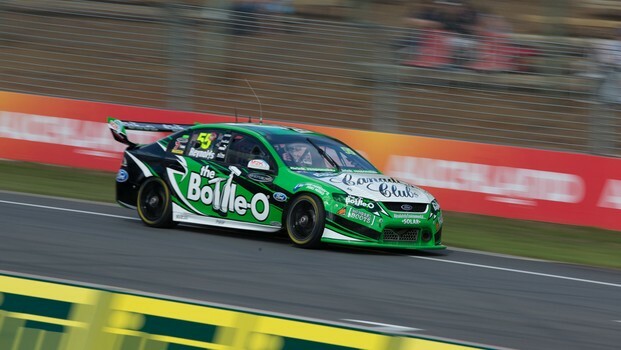 When we put on our second set of tyres and had a good crack at it, the car balance came back to us, the car flowed really nice, we made an improvement at the second run and it became a nicer car to drive. "We didn't get the maximum out of the car but from where we started this morning I'm really happy and looking forward to tomorrow." "Day one at Pukekohe was a reasonable day. We had the same tyres on for practice 1, 2 and 3. We made some gains on the old tyres but never got to show our pace. Practice 4 we put on new tyres and the car was really good. We ended up 6th for that session and there is still a little bit more in the car. "Press on for qualifying tomorrow morning and we are good stead for the weekend. "It has been cool to compete in front of my home fans and hopefully there are a lot that come out." "I started off really good this morning and made quite a few changes but our speed was encouraging and we were consistent throughout the day. My new race engineer Nathaniel and I are working really well together and that is beginning to pay off in more consistent handling. We'll work on a few things tonight and hopefully qualify well in the two short sessions in the morning." "I wouldn't say it was an excellent result, but it is definitely an improvement on where we've been. "The nature of this circuit seems to suit our car better and we're pleased with the progress that Nissan Motorsport is making. "It's my first time here, and this is a bloody great race track. We are pretty lucky that we come here. Most of the tracks that we go to are flat and lack character. You get to drive the wheels off the car here and you get rewarded when you get it right. "The new addition to the circuit makes it better because it adds a few more corners and gives it a different challenge. I think it will make for some good racing tomorrow and Sunday." "Our day was reasonably good though we got a little lost on set-up in practice two and three. The car was inconsistent and I lost my way a little bit though it started to feel better once we put the green tyres on at the end of the day. "There is definitely a bit of time to find in the car and the driver, but the car felt more normal and less inconsistent by the last session. I could drive it better and while we lost a bit of momentum in the middle of the day, we recovered well and I am pretty comfortable with where we ended up. We should make a good jump forward for qualifying." "I was disappointed with how we ended the day but we are definitely in the top few cars on old tyres which is encouraging. I put a new set on at the end but had a shocking run and that didn't really show where we're at as I didn't even go close to putting a neat lap together. I am pretty sure that we can easily tune the car for qualifying so we'll work on it tonight and see what we end up with." "I'm really happy with today, the first couple of practice sessions we were down a fair way and we really hurt or tyres in those early two practices, so to actually find significant time in the fourth one and bring ourselves up to 11th or 12th before people started running greens is really positive. "The track really came to us throughout the day and the few changes we made really boosted us up towards the end. "I think most people were on greens apart from three or four and we're in P13, and as a driver I think I could have done little bit of better job and got maybe another tenth and a half out of it, which would have just snuck us in the top 10. "For us at the moment I think that's really positive, if we can manage a couple of top 10s over the weekend it's a really good step forward and it also means some good points for us." "It has been a good day across the four practice sessions. Our pace was really good and we worked on the set up for qualifying and for the races. "I didn't get the best of laps on my green tyres, with a lock up at turn 8 and we lost time, without that we would have been in the top 10. "The car is very consistent and looking forward to tomorrow to be in top 10, the car is really good to drive and I have enjoyed my first day at Pukekohe and learning the track. "It is an amazing track, I like this type of race track and looking forward to a really good weekend." "We ran a set of tyres at the end of the final session, but didn't have the car quite as good as we did in the previous session, we were 10th in the previous session on the old tyres. "If we put the car back to how it was then and make some little tweaks from what we just learnt, I think we should be much better off than where we currently are. "Certainly we have a lot more potential at the moment than we've had at the last couple of rounds, so I'm looking forward to seeing how the weekend pans out." "The car had a really good balance right from the first session this morning. We ran the first two sessions on older tyres then popped our green set in P3 and got a strong gain. Position 5 was a great result for the Wilson Security Falcon. I think we are in the ballpark here and a few tenths should see us right in that mid field battle. The track is great, very quick and bumpy but the car is responding well and I am enjoying it." "It's the first time for me here at Pukekohe – I'd never been here before – and man, it's a cool joint. "I can see why V8 Supercars has brought us back here. There's a couple of places where you've got to put everything on the line, maximum commitment, and the Norton Altima has been great today. "We only used one set of (new) tyres today. In the final session, we were down the order a bit, but a lot of guys used a second set of tyres and we didn't, so I was comfortable with the car straight away and it was encouraging to be sixth in the second session. "Everyone had the opinion of running a second set in practice, but until they start paying points for practice, I think I'll keep the rubber in my bank and use them when it counts tomorrow. "We got through some changes on the car. Some worked, some didn't, but fundamentally, we rolled the car off the cargo ship and the balance was very good." "It is great to be part of the V8 Supercars return to Pukekohe. We had some interesting sessions today, but really found all the gains in P4. Frankly we were struggling a bit early on, but 'Wally' (engineer Ian Walburn) found a few tweaks which really helped. As we did not have a great run on the green tyres it was pleasing to find the time on older tyres. The car was more stable so we should be able improve in Qualifying."